By Alan Green in Salt Lake Potash (SO4) on 29th January 2019 . Comprehensive field evaporation trials at Lake Way are successfully producing substantial volumes of potassium Harvest Salts validating the modelled salt production process. Field evaporation trials have to date produced over 2 tonnes of high grade Harvest Salts at Lake Way. Over 100,000l of brine from both high grade Lake Way playa brine and the super high-grade Williamson Pit brine have been extracted for the field trial and evaporated separately. Both brines have rapidly produced quality harvest salts amenable for conversion to Sulphate of Potash (SOP). Potassium Harvest Salts produced from the field trial will be processed at Saskatchewan Research Council (SRC), where a pilot plant will duplicate and refine the Lake Way process flow sheet, as well as producing further product samples for offtake partners. 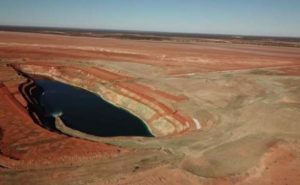 The Company is focused on rapidly progressing the development of the Lake Way Project to become the first Sulphate of Potash (SOP) production operation in Australia. Lake Way has the highest grade SOP brine resource in Australia and the best infrastructure solution of potential Australian brine SOP producers. A major component of the feasibility study process for the Lake Way Project is to develop a brine evaporation and salt production model based on the brine chemistry of both Lake Way playa and Williamson Pit brines under local environmental (evaporation) conditions. Initially, this model was based on a computer simulation generated by international brine processing experts Ad Infinitum, from known brine chemistry (from assays) and comprehensive public weather datasets. In this case the model was also informed by the Company’s unique database of more than 18 months of field evaporation trials at Lake Wells, reflecting similar chemistry and environmental inputs. In the second stage of the model development the computer simulation was calibrated against and updated for the results of wind tunnel evaporation tests of Lake Way brines under laboratory conditions. Thirdly, the model is now being further refined by establishing a site evaporation trial, where a scaled down version of an evaporation pond system is established on site and brine is evaporated under actual field conditions. Both brine chemistry and salt production are closely monitored. The Lake Way SET was established in May/June 2018 and initial brine feed was gradually introduced from both the Williamson Pit (SOP resource grade 25kg/m3) and the Lake Way playa (SOP resource grade 14kg/m3) (refer Note 1 for full mineral resource estimate). Over 100,000 litres of Williamson Pit and the Lake Way Playa brine has been fed into the SET pond system to date. Brine is sourced from a surface trench, for the Lake Way Playa brine, or direct from the Williamson Pit and introduced into a Halite Pond. As solar evaporation concentrates the brine, it progresses through a series of 5 ponds: two halite salt ponds, and then schoenite, kainite and carnallite salt ponds. Harvested salt and brine samples are analysed at regular intervals through the evaporation process to gather data for model correlation. To date over 400 samples have been extracted and assayed at Bureau Veritas in Perth. Refer to Figures 4 and 5 in the ASX version of this Announcement available on the Company’s website (www.saltlakepotash.com.au) which set out the results from the Lake Way SET to date, demonstrating an excellent correlation to the salt production model. This provides the Company with a very strong basis to continue development of the mass balance model and process flow sheet for the Lake Way Project. It was found that halite salts begin to form almost immediately upon initial evaporation of the Williamson Pit brine. This will shorten the overall salt production timeframe for the Williamson Pit brine. It may also offer the opportunity for faster construction of harvest pond infrastructure, utilising harvested halite salts for pavement. The Lake Way SET has already produced over 2 tonnes of Potassium Harvest Salts (1.8 tonnes Lake Way Playa and 0.4 tonnes of Williamson Pit) and a further 5 tonnes are forecast to be harvested during ongoing evaporation trails. From the test work to date, the Williamson Pit and the Lake Way Playa brines have produced excellent high grade Harvest Potassium Salts with an exceptional K grade of up to 10% and an overall high average K grade of 6.8%. This aligns very well with the grades that were observed during the Lake Wells SET’s. This provides the Company with confidence that the Lake Way production model, process flowsheet and Harvest Salt product will produce a final high grade SOP product in line with the world leading SOP product of 53% K2O produced at Lake Wells. The Company has engaged the world’s leading potash processing laboratory, Saskatchewan Research Council (SRC), to establish a pilot plant based on the process flow sheet for the Lake Way Project. The initial batch of harvest salts from Lake Way has been delivered to SRC and testwork is underway. The pilot plant will validate and refine the Lake Way process flowsheet and also produce high-grade SOP product samples for offtake partners. 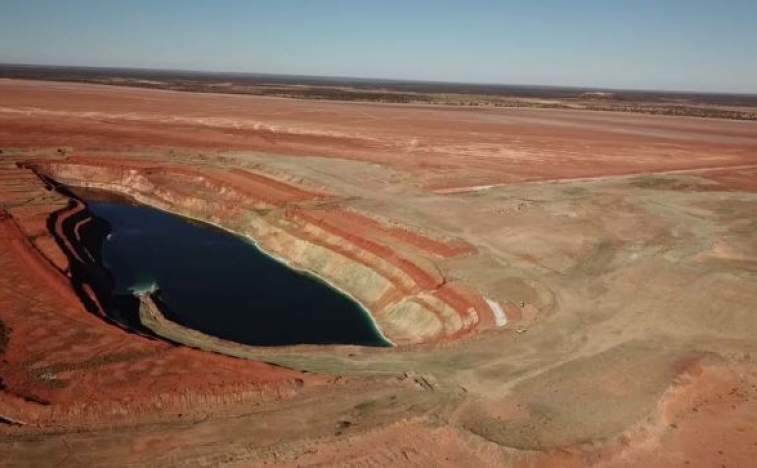 Work is currently underway to enable the Company to report a Mineral Resource Estimate for the lake bed brine and the paleochannel aquifer for the ‘whole of lake’, which will enable the Company to examine larger production options. The information in this report that relates to Process Testwork Results is based on, and fairly represents, information compiled by Mr Bryn Jones, BAppSc (Chem), MEng (Mining) who is a Fellow of the AusIMM. Mr Jones is a Director of Salt Potash Limited. Mr Jones has sufficient experience, which is relevant to the style of mineralisation and type of deposit under consideration and to the activity which he is undertaking, to qualify as a Competent Person as defined in the 2012 Edition of the ‘Australasian Code for Reporting of Exploration Results, Mineral Resources and Ore Reserves’. Mr Jones consents to the inclusion in the report of the matters based on his information in the form and context in which it appears. The information in this Announcement that relates to Mineral Resources is extracted from the report entitled ‘Scoping Study for Low Capex, High Margin Demonstration Plant at Lake Way’ dated 31 July 2018. This announcement is available to view on www.saltlakepotash.com.au. The information in the original ASX Announcement that related to Mineral Resources was based on, and fairly represents, information compiled by Mr Ben Jeuken, who is a member Australian Institute of Mining and Metallurgy and a member of the International Association of Hydrogeologists. Mr Jeuken is employed by Groundwater Science Pty Ltd, an independent consulting company. Mr Jeuken has sufficient experience, which is relevant to the style of mineralisation and type of deposit under consideration and to the activity, which he is undertaking to qualify as a Competent Person as defined in the 2012 Edition of the ‘Australasian Code for Reporting of Exploration Results, Mineral Resources and Ore Reserves’. Salt Lake Potash Limited confirms that it is not aware of any new information or data that materially affects the information included in the original market announcement and, in the case of estimates of Mineral Resources, that all material assumptions and technical parameters underpinning the estimates in the relevant market announcement continue to apply and have not materially changed. Salt Lake Potash Limited confirms that the form and context in which the Competent Person’s findings are presented have not been materially modified from the original market announcement. · Nature and quality of sampling (e.g. cut channels, random chips, or specific specialised industry standard measurement tools appropriate to the minerals under investigation, such as downhole gamma sondes, or handheld XRF instruments, etc.). These examples should not be taken as limiting the broad meaning of sampling. · Include reference to measures taken to ensure sample presentively and the appropriate calibration of any measurement tools or systems used. · In cases where ‘industry standard’ work has been done, this would be relatively simple (e.g. ‘reverse circulation drilling was used to obtain 1 m samples from which 3 kg was pulverised to produce a 30 g charge for fire assay’). In other cases, more explanation may be required, such as where there is coarse gold that has inherent sampling problems. Unusual commodities or mineralisation types (e.g. submarine nodules) may warrant disclosure of detailed information. Sampling involved extraction of small, representative samples of brine from solar ponds into 50ml or 250ml clean bottles. The solar ponds consist of re-purposed temporary above-ground swimming pools and HDPE aquaculture tubs. 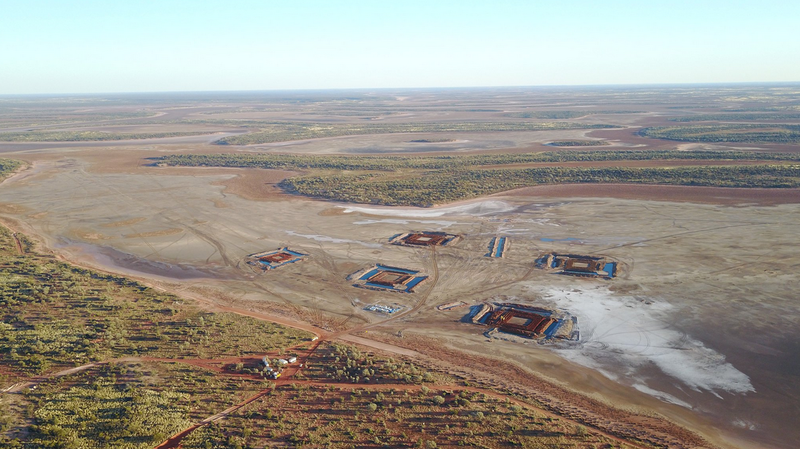 These solar ponds were filled with brine drawn from either the Williamson Pit directly or from Lake Way Playa Brine from a 4m deep test pit excavated next to the trial. Brine samples were taken from each solar evaporation pond regularly and routinely during the solar evaporation process. Brine samples were taken manually by initially rinsing out the sample bottle with brine from the source then filling the bottle. Samples were analysed for K, Mg, Ca, Na, Cl, SO4, TDS and specific gravity. The temperature and pressure in each pond were logged electronically with piezometers. Once the brine in a particular solar pond had concentrated to pre-determined point it was pumped to another solar pond downstream in the process. Salt was then extracted from the drained solar pond. Harvested salt is then crushed, either by hand or using a small jaw crusher to 100% passing 25mm, where the typical particle size is <5mm. The crushed salt was then coned and quartered multiple times until a 250g representative salt sample was obtained. Brine is a homogenous fluid below the surface, while salt samples are cone and quartered to provide a homogenous sample. · Drill type (e.g. core, reverse circulation, open-hole hammer, rotary air blast, auger, Bangka, sonic, etc.) and details (e.g. core diameter, triple or standard tube, depth of diamond tails, face-sampling bit or other type, whether core is oriented and if so, by what method, etc.). No drilling was undertaken during the site evaporation trial. No core was recovered from the site evaporation trial. Brine samples taken from the ponds, were sampled from beneath the surface of the ponds, thus were representative of the entire pond as the ponds are small enough to act as a homogeneous liquid bodies. Salt samples were crushed, coned and quartered to ensure sample representativeness. The crushing and homogenisation lowers the risk of preferential loss/gain of one size fraction over another. · Whether logging is qualitative or quantitative in nature. Core (or costean, channel, etc.) photography. · If non-core, whether riffled, tube sampled, rotary split, etc. and whether sampled wet or dry. · Measures taken to ensure that the sampling is representative of the insitu material collected, including for instance results for field duplicate/second-half sampling. Not applicable, no drilling was undertaken during the site evaporation trial. The samples were taken in sterile plastic bottles of 50ml or 250ml capacity. Brine is a homogenous fluid below the surface, while salt is cone and quartered to homogenise and sample. Brine was diluted (1:10 in de-ionised water) at the lab to ensure accurate determination by ICP. Salt was crushed to <25mm and homogenising to ensure that the 200-300g subsample taken is representative for the grain size. 50g of the wet homogenised sample is air dried at ambient temperature and sent for XRD. Following this the sample is crushed with a mortar and pestle to <120um. It is then packed into a pellet to undergo XRD analysis. 10g of the wet homogenised sample is air dried at ambient temperature. Residual moisture is determined by acetone-displacement wash followed by drying at a temperature of 60 degrees Celsius. Following this drying, the salt sample is dissolved in 100ml of de-ionised water, and is sent for ICP analysis. · For geophysical tools, spectrometers, handheld XRF instruments, etc., the parameters used in determining the analysis including instrument make and model, reading times, calibrations factors applied and their derivation, etc. The brine and salt samples were sent to Bureau Veritas (BV) Laboratories in Perth, WA. ICP and XRD preparation undertaken at BV. ICP analysis to determine the chemical ion analysis, and wet chemistry titration to determine chloride content was performed by Bureau Veritas, Canning Vale, WA. Sub samples prepared at BV were sent for XRD analysis to determine the salt crystal mineralogy at Microanalysis in Perth, WA. All BV laboratories work to documented procedures compliant with ISO 9001 Quality Management Systems. Rigorous quality control and quality assurance measures are applied throughout the entire process in their laboratories. • Analysis of blanks within each batch. • The routine testing of suitable certified reference materials from national and international suppliers, in addition to in-house and client supplied standards. Standards will be selected based on the elements of interest, expected range of concentration, and the analytical method used. • Duplicate samples are included in each batch to ensure that reproducible results are being achieved. Duplicate samples may be solutions, pulps or coarse splits as requested. • Re-assay of anomalous results by our quality control staff using techniques considered appropriate for the level of analytes encountered. • All sample results are reported. All blanks and standards are reported on request. Microanalysis uses XRD, which is semi-quantitative, as it does not take into account preferred orientation, strain or crystallite size. The amorphous content is estimated using the background ratio rather than an internal spike. All procedures are internally validated. Microanalysis Australia has an established QA/QC system of procedures for receipt, preparation and analysis of samples. All instruments are calibrated monthly with a certified reference standard. They run a calibration check using a certified Panalytical silicon standard monthly and monitor source decay. Repeatability studies have been undertaken to verify subsampling procedures. Every tenth sample is repeated to verify repeatability and consistency of results. Not applicable, brine is a homogenous fluid below the surface. All sampling and assaying is well documented and contained on SLP’s internal databases. No adjustments have been made to assay data. Location data is not relevant for this process test and so was not taken. Brine samples were taken at appropriate time intervals, either weekly or biweekly, to gain sufficient resolution on the brines’ evaporation pathway. Salt samples were taken at pre-determined brine concentrations from prior modelling and so are indicative of the salts produced between the pre-determined harvest points. Sample compositing has not been applied. Not applicable as harvest salts were homogenised. Drilling orientation is Not applicable. The entire mass of salt produced by the solar pond was harvested, homogenised and sent for assay. SLP field geologists and engineers were responsible for sampling and homogenising all brine and salt samples prior to shipping to the BV lab in Perth and the SLP lab/warehouse. The security measures for the material and type of sampling at hand was appropriate. On the 9th March 2018 Salt Lake Potash Ltd and Blackham Resources Ltd signed a gold and brine minerals memorandum of understanding. Under this MOU Blackham has granted the brine rights on its Lake Way tenement free from encumbrances to SLP. No prior process (solar evaporation) test work has been undertaken on the brine from Williamson Pit or Lake Way Playa. 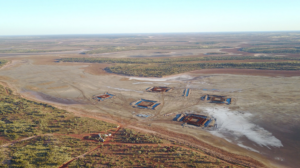 The Company has previously reported a brine resource over the Blackham tenements – refer ASX Announcement 31 July 2018. There is a database of approximately 6200 boreholes across Lake Way of which some 1000 are within the Blackham tenements. The primary source for the information is the publicly available Western Australian Mineral Exploration (WAMEX) report data base. Recent sterilisation drilling has also been undertaken by Blackham Resources. The data from previous exploration work by other parties has not been used in appraising the results of the process testwork included in this announcement. The brine is concentrated in solar evaporation ponds and the salt is precipitated into the evaporation ponds as fine (0.5 – 5mm) crystals that form a single, homogeneous salt bed. Harvested salt from the solar evaporation ponds are homogenised, assayed weighed to provide the estimated grade. Average salt grade for each evaporation trial is determined by a weighted average, where the grade/mineralogy of each individual harvest is multiplied by the total wet mass of the harvest. The sum of these harvest grades is then divided by the total salt output from the pond. · If it is not known and only the downhole lengths are reported, there should be a clear statement to this effect (e.g. ‘down hole length, true width not known’). Not applicable to process testwork. Maps and sections not included for process testwork. Refer prior ASX Announcement dated 31 July 2018. All results have been included in the body of the report. · Other exploration data, if meaningful and material, should be reported including (but not limited to): geological observations; geophysical survey results; geochemical survey results; bulk samples – size and method of treatment; metallurgical test results; bulk density, groundwater, geotechnical and rock characteristics; potential deleterious or contaminating substances. All material process data has been reported. Field evaporation trials are ongoing. Downstream metallurgical test work on harvested salts will be undertaken by a world leading potash research laboratory to confirm the harvest salts may be converted to potash product.